This product is excellent for target practice and hunting. It is both economical and precision manufactured by an established International cartridge producer. Each round is manufactured in Taiwan and has a boxer-primed brass casing, non-corrosive propellant, and a non-magnetic full metal jacketed bullet. GREAT GREAT AMMO. The only thing I've noticed is that a few times my bolt fails to lock back on last round, which isn't an issue at all for me, only happened about 3 times out of a thousand rounds. Pretty clean for the price and would definitely trust my life to it any day of the week. Ordered on Mon had it on Thurs, at the range on Sun. 1st 100rds through Tavor X95 no problems, will see how the ACR, AUG and FS2000 like it. Customer service is always AAA+++ will order more when I can afford it. Shoots great with no jams. 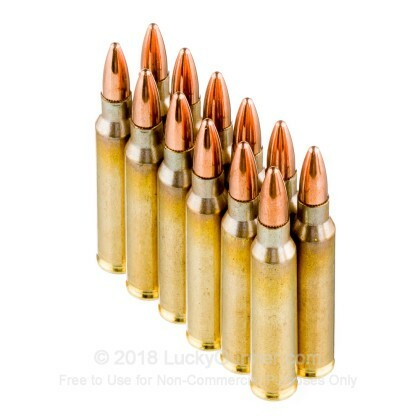 This is a much cleaner ammo than the Federal xm193. Quality bullets, good powder, new brass, sealed primer and bullet, annealed case mouth, what's not to like? This is great ammo Wolf imports from Taiwan. i shoot this brand ammo in all my ar's . suppressed or not , very reliable, accurate and clean .i would trust my life with this ammo . I have shot around 400 (55g) rounds down range and not one failure, very accurate I’m well pleased with this wolf product. My carbine length gas system AR15 (16 in. barrel) hates this ammo and has consistent malfunctions with it. It is also the only ammo that has ever caused any malfunctions in that particular rifle. However, my rifle length gas system AR15 (20 in. barrel) functions flawlessly using this ammo. So it may depend on your rifle. Have purchased many times. Great range ammo. Pretty accurate,nice shiny brass. Great bargain. Bought 1000 rounds and have shot 400 rounds with no misfires or jams , will buy again !! Shot over 1000 rounds had no problems Delivery was very fast .I will be ordering again and again. Best .223 out there for the price! Solid accuracy and great quality. Ordered 1000 rounds of Wolf Gold 223 a couple weeks ago, in the evening. Delivered to my house 36 hours later. Box was in great shape, ammo is great for my purposes, really nice follow up by the folks (hi Chris and Angela!) at Lucky Gunner. Haven't had any misfires to date. Doesn't dirty my firearms to bad. Good value and really fast delivery. Fast delivery, box intact, shoots good, no problems with it, would buy again. Reliable ammo! While not match ammunition, this is the best bang for the buck. It runs well in my AR's, Tavor, Keltec SU-16C and FN M249S. I'll be ordering more! Highly recommended! I've only put about 500 rounds through my M4 but have had no issues at all. I will continue to buy when ever I need to restock. Ordered 1000 rounds of Wolf Gold 223 on Tuesday at 4:00PM. Was on my porch 11:00AM Wednesday morning. What took so long? (LOL) Great job guys and gals. Great price on this ammo. Shoots pretty good and the best shipping I've dealt with for ammo. This is the only ammo I have had a miss fire using 223 ammo. Had to recycle two rounds to fire. Each cartridge showed the primer had already been struck by the firing pin. In my shooting history I have fired in excess of eight thousand rounds of different calibers and manufacturers. 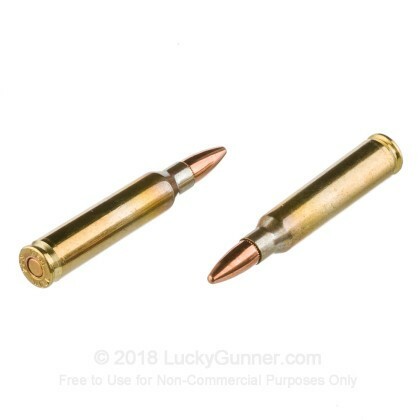 Just a very little stretch cost wise for this BRASS cased ammo. Made in Taiwan for the wolf name brand. I have used some that came in today. 55 gr round fly's nicely through my Adams Arms piston upper with the 1X7 twist no problems at all. Also fired in my N Pap 85 pistol sure my Mossberg MVP will have no issue with the stuff. Nice slight kick showed compared to some handloads I made. Brass is nice enough stuff for reloading. Annealed not quit Lake City but no where near the work to prep for reloading either. Buy it while you still can ! This is my new favorite target round. Great price, no fte/ftf, runs pretty clean. I've gone through nearly 1000 rounds of this and I have to say, no fte/ftf through my S&W m&p15. If you want really good near match grade ammo in bulk, this is the ammo for you! I love it and need to get a few more thousand rounds! I have shot over 600 rounds without any complications, 90 rounds rapid fire. It seems to shoot has clean as four other brands of ammo I have shot through the rifle. 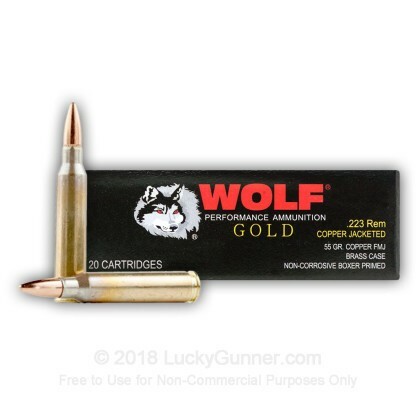 Plan on buying more Wolf Gold ammo. Wolf Gold is excellent round no FTF or FTE over 1,000 rounds down range can't beat the service or price, thanks Luckygunner! 6000 rounds with no malfunctions. I take a lot of training classes and have been happy with this ammo. No malfunctions in 6000 rounds over the last three or four classes. Price is decent for ammo with no steel components. I love that I can get brass cased ammo at this price. I didn't have a single fail to feed fail to extract or fail to fire. Will purchase again. No malfunctions, accurate rounds, and cost effective. Awesome buying experience from LG! Put the first 100 through my Weatherby AR and could not be more pleased. Will definitely buy this brand again! Well I purchased these 223 rounds in bulk of 1000 rounds. I feel its a great value. Upon inspection they look good and were fairly clean. I went out and shot thru about 400 rounds in my Bushmaster AR-15. I had no problems. Very happy with these rounds. GREAT PRODUCT!!! Usual speedy delivery. I used my New Wolf Gold for an AR match and they worked SUPER!!! Got them with the same speedy delivery. Lucky Gunner is very easy to watch for your price Order and receive your product and then stock up, plink, hunt or whatever your pleasure. 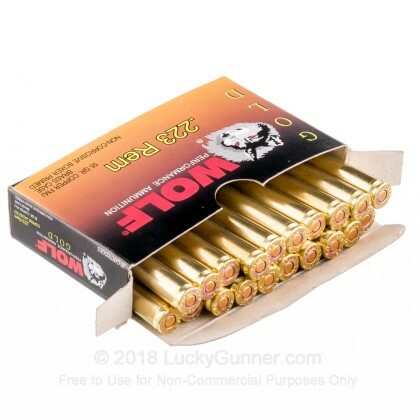 This is a quality clean ammo at a reasonable price. The service was OUTSTANDING!!! !..I ordered it late one afternoon and 2 days later it was on my doorstep =)... LG's service is amazing! I have shot about 300 rounds of the case I bought through my M4, no failure to feed or misfires. Reliable so far and not too dirty for what it is. The brass looks good enough that my shooting partner was scrambling to pick up the empties to reload. Might burn a little hot, but then again, maybe I was just having too much fun :) !!!! I use this website for all my ammo needs. The cost was very affordable. This was the seventh case I purchased. Quick delivery. A flawless experience! Fantastic price, fantastic shipping, fantastic service. I couldn't be happier and I can't recommend LuckyGunner highly enough! Please continue to support this great company! I use this ammo for practice in my Ruger American rifle. Very pleased. So far no problems in my Bushmaster. Brass is good. Seems to be fairly clean. Fast delivery and good value compared to others at the time. I shot about 200 rounds this past weekend. I'm not a big steel fan so when I bought this brass-cased stuff from Wolf I was a little bit scared. No malfunctions and seemed as accurate as most others. Will definitely consider if the price is right. Quick ship as usual. Clean well boxed ammo. On the range performance exceeded my expectations and I am very pleased with the Wolf Gold and will purchase again. Pleased with price too ! and a buddy`s colt le6920 . Shot several hundred rounds with one double feed, overall good value. I bought a box of 1000 rounds and everyone went bang. I put this ammo through three different AR15's. One of the AR15's being a piston driven and the other two direct impingement. I did some mag dumps with the ammo and it worked flawlessly with my AR15's. My rifles were no dirtier using this ammo than the PMC, PPU and Remington ammunition I had put through them in the past. I did however have a couple of issues when I was using these in my Mini 14 but I believe the issue was caused by the Ruger 30 round factory magazine malfunctioning. Occasionally the bolt would extract the spent brass but would not pick up a new round. Even after I lubed up the mini 14 this would happen on two of the six magazines I own. Other than the mini 14 which is not my shtf rifle I would highly recommend this ammo to anyone who wants ammunition for their AR15's. I will buy more of the ammo in the future. Lucky gunner was great to deal with, no problems good service! Ran several hundred rounds through our Colt AR-15 this weekend. Would definitely purchase from them again!!! Ran approximately 120 rounds through my Mini-14 with no difficulty whatever. I bought this more for storing up for later use. Since it was the first time I test fired 60 rounds and had no problems in DPMS AR. Would by more as it should store well do to being sealed on both ends. Haven't yet fired ammo from my recent purchase. It was however delivered promptly and was as described. Wolf Gold, Worth a second look. all the spent cases were piled in an area just over a foot and a half in diameter. The only thing that would improve this ammo is to offer it in FMJ BT. I shot this Ammo in my Ruger SR 556 rifle. No problems of any kind, NONE! I'm happy with the price I paid, (not as good as it was 2 years ago) but with today's prices, not to bad. I'm also happy with LuckyGunner. This was my first order with them and I'm pleased with them. This ammo shoots well and did not have any jams. Down range velocity was good and the ammo shot consistently accurate. Price is a good value and allows for plenty of range practice. This ammo is every bit as good as PMC ammo I would recommend this ammo to every body and I am going to continue to buy this ammo for the price you cannot beat it. Great ammo, service and web site honesty. The price is tolerable, not much else needs to be said. I shoot Wolf Gold Match 75 gr. in my Clark Custom AR as well as the 55 gr. Wolf Gold in my Colt full auto and have had no failures. Yep shoot quiet a bit and honestly don't need much cleaning. 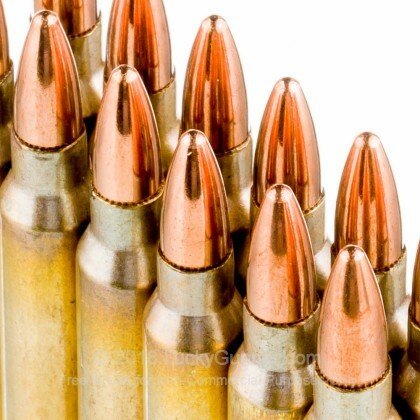 The PMC Bronze in 50 bmg is great ammo as well. To the folks at LuckyGunner thx for ur service and should be ordering soon. Not one single mis-fire or jam, clean up easy, accurate as the person behind the gun. Shipping very fast, very happy with price. Lucky gunner am I for buying this. First time firing my new Bushmaster AR 15. Shot about 70% within a 4 inch spread at 50 yards, with open sight. No jams and a reasonable clean up. Brandon you ask if this ammo burns dirty, well I used noyhing but PMC in my ar15, and this stuff burns a little hotter but a little cleaner too. It's alsoed sealed so it good if you want to save it for 10 or 15 years. I'm going to start using this ammo all the time. I bought a case and have shot over 800 rounds and did not have one mis fire or gams. But don't take my word on it, go to youtube and click on Wolf Gold.223 ammo you tube. A guy from the MILITARY ARH CHANNEL will explain how good this ammo is. A: Hello Tim, This Wolf Gold ammunition is loaded in boxer primed brass cases and can be reloaded. A: Hello GH! The Wolf Gold is a standard FMJ bullet featuring a lead core and a copper jacket. The ammunition will not attract a magnet so it is safe at any ranges with that type of restriction! A: Hey Greg! Thanks for visiting us from down under! Unfortunately, due to export laws here and Australian law, we are unable to send ammo your way. We wish we could but we're limited to the lower-48 states over here in the U.S. for the time being due to the regulation. Thank you for thinking of us and we hope you enjoyed the site. It's great to hear from a shooter from the other side of the world! 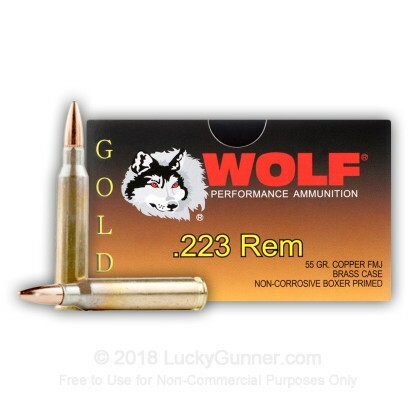 We also have this 223 Rem - 55 Grain - Wolf Gold FMJ - 20 Rounds ammo in stock in a smaller quantity.